I have listed a new property at DL 459 TATALROSE RD in Burns Lake. An opportunity to acquire 1600 ft of lake front. It is a remote and private, 178 acre raw land property. There are 3 benches on the way down to the waterfront that would make excellent building locations. The property was logged about 50 years ago and regrowth is coming back. I have listed a new property at 1465 INDIAN BAY RD in Burns Lake. Ready to move into two bedroom house or water front cabin. Every one can enjoy the 100 feet of low bank water front on Francois lake. Mom will love the convenient open area kitchen, dining and living room with an excellent view of the Lake. Kids just love the loft and the outdoor play house. Dad will enjoy the basement workshop and the large tent garage. Heat can be a combination of an oil furnace, pellet furnace or the wood heater in the living room. Barbecue can be done on the covered balcony year round. There are sheds for (lawn) tractors, skidoos or other toys. Lots of room to park vehicles. There is an RV hook up at the corner of the house. The seller is willing to include some home furnishings. I have listed a new property at 27244 WILSON RD in South Francois. Home with a cathedral ceiling living room/dinning room, excellent lake/mountain view, 3 bedrooms, and electric /wood forced air heat. Features a covered sun room, a large attached workshop and garage. Enjoy 180 ft of lowbank sandy beach lakeshore. The permanent dock males easy acces to Francois Lake with excellent char and trout fishing in this area. I have listed a new property at 11254 TATALROSE RD in Burns Lake. A one level 1600 sq. ft home with two bedrooms, an office, large living room, and spacious kitchen dinning area. Attached wood shed makes wood heating easy. Back up pellet stove and electric heat. The property has a guest cabin, garage, green house, barn and a few other out buildings and fruit trees. There is a natural pond on the property that attracts wildlife. Part of the property is fenced. The seller says the well produces lots of water, and is motivated to sell. So make an offer. I have listed a new property at 23514 TATALROSE RD in Burns Lake. Remote one bedroom cabin with a full basement is in an ideal retreat location. This will make an base camp for anyone that enjoys privacy. The cabin has a new metal roof and new insulation. The generator and uninstalled solar panels, propane fridge, Propane stove and propane clothes dryer will go with the cabin in an as is where is condition. The water supply is powered by a 12 volt battery to run a recreational vehicle water pump. Furnishings can be included in the sale. There is also a small one room cabin with wood heat for guests or storage. The Garage with a lean to are used to store the generator, and keep the firewood dry. Although the property is remote, it is only 2 km away from a major Forest Service Road. 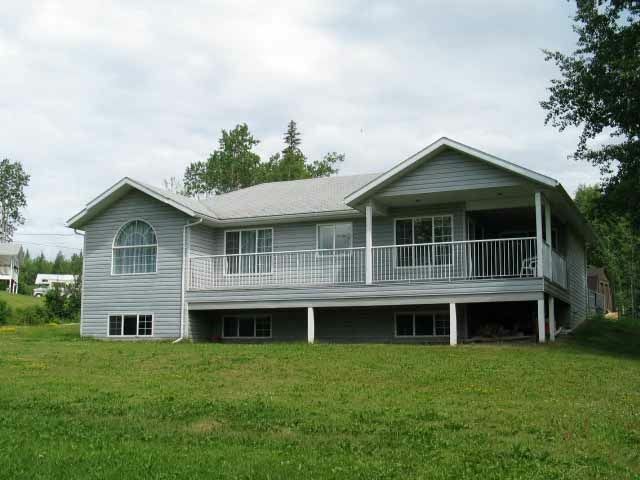 I have listed a new property at DL 337 TATALROSE RD in Burns Lake. Excellent waterfront with over a half-mile of frontage on Francois Lake. This lake is noted for lake trout and rainbow trout. It is not in the ALR and zoned Rural Residential, so it can be subdivided into 3 parcels. About 1/4 of theproperty is cleared and grazed. The creek on the property, and a mixture of timber, are a bonus. Hydro is already on the land, and comes in along an undeveloped, surveyed road. The present access to the property is a private old post office road. This property offers a mixture of opportunities from a homestead, recreational/hunting destination, or an investment property. Don't wait to invest...invest and wait! I have listed a new property at 27293 KEEFE'S LANDING RD in Burns Lake. This is a large older home with over 2000 sq ft on the main floor with a 30 ft long kitchen dining area and a 30 ft long media/living room. There is lots of room for family and guests with 5 or more bedrooms. It has a lot of extra featureslike: pantry off the kitchen, basement entrance to the workshop, closed in back porch, fire wood storage room in the basement, covered walkway from the double Garage, a paved yard, a second 24x40 three bay garage, a 20 x 30 machine shop with covered storage beside it, a 14x 40 ft chicken house, green house and lots of garden area. If you are looking for a larger home with lots of room for machinery or toys, this is a must to see. I have listed a new property at 6901 TAKYSIE PIT RD in Burns Lake. Log home with 4 bedrooms on 98 acres and more than 1.6 km of water frontage on Taksie Lake, a tourist attraction for trout fishing. Enjoy a private setting 3 km from the main Eakin Settlement Road with a lake view from the living room window, from the picnic table on the deck and/or from the camp fire. The Home features a two way fire place between the Living Room and the Dining Room. There are at 9 other buildings on the property, including a shop, 7 covered parking spaces, Tractor shed. 2 wood sheds, 2 green houses, a old log cabin, Calf shelter. There is abundant wild life visits to the property. The Property is not zoned and is located in the ALR. I have listed a new property at 37886 EAKIN SETTLEMENT RD in Burns Lake. Great summer resort location, a one bedroom Summer cabin on Takysie Lake with a Guest cabin for the company. The Main cabin has a wood decor with a open kitchen / living room with a view of Takysie Lake through the trees. The guest cabin has electricity, a kitchen sink and a detached outdoor toilet. Fridge, Stove, washer/dryer and Bio toilet can be included in the sale. Takysie lake is known for good trout fishing and there are lots of other good fishing / Boating / hunting / hiking areas to explore. I have listed a new property at TATALROSE RD in Burns Lake. 80 acres with Tatalrose Road going through the property. Hydro and telephone are along the edge of the road, making it desirable property. This property has been logged, and volunteer second growth is starting to come back.The property is not zoned and is in the ALR. The property has many farms to the east, south, and west, and there are several small lakes in the area. There is Crown Land on the northwest side of this property. I have listed a new property at 13966 TATALROSE RD in Burns Lake. Three bedroom 1330 sq ft up and 1222 sq ft down, farm home with view of hay fields and mountains, with wood elec heat. Included are a 50x50 shop/storage, 20x30 barn, workshop, riding area. All this and more on 80 acres with a year round creek, abundant wild life, and 2 springs on the property. The property was fully fenced several years ago. Desirable waterfront with large dock and excellent view from the three bedroom, executive class home. The main living room has a wood fireplace. With an excellent lake view you can relax in sauna or workout on the exercise equipment on thelower level with the warmth from the pellet heater in the lower living room while listening to the house wired sound system. Garage/workshop has an upstairs on room guest suite with finished floors and walls and roughed in plumbing and electrical. Partial trade for a home in North Delta or Tsawwassen or a smaller recreation property elsewhere in BC will be considered. I have listed a new property at 1802 UNCHA LAKE RD in Burns Lake. Beautiful view, yard and home on low bank Francois Lake waterfront. This home has a L-shaped lower deck off the living room and a upper deck from the master bedroom that faces the lake. The hot tub on the lower deck is included. The kitchen, (dining) and living room are open and spacious with a great view from large windows facing the lake. The major rooms in the house feature a natural wood finish. The garage has three bays or you could use one of the bays as a workshop area. The home has wood electric heat with a room for wood storage in the basement. Water is from the lake and the septic field is approved. The fridge, stove and dishwasher are included. Not included but willing to negotiate - two Sea-doos on a trailer. I have sold a property at 0 INDIAN BAY RD in Burns Lake. A pleasant and desirable vinyl sided two bedroom cottage with 6 inch exterior wa lls on the shore of Francois Lake. Close to a sandy beach. Close to the ferry on the south side. Water line is in the lake. I have listed a new property at 6328 HAMRE RD in Burns Lake. Exceptional 4000 sq ft full basement family home on 169 acres. Bright open kitchen/dining area with oak cabinets. Fireplace & pellet stove. Features such as full length deck, outbuildings, fenced & x-fenced, 40x60 fully serviced shop with cement floor, propane radiant heat & 2 - 14' overhead door. Magnificent views overlooking mountain range & small lake plus a creek runs thru property.